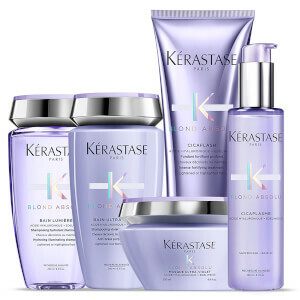 The Kérastase Blond Absolu Bain Lumière Shampoo, Treatment and Masque Trio has been carefully curated to care for your blonde hair. 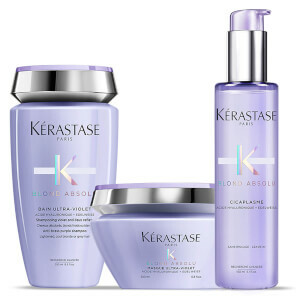 Nourishing and illuminating, the three-piece set will leave locks looking vibrant, replenishing and radiant. 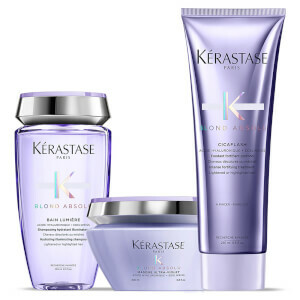 Shampoo: Wet hair then thoroughly remove excess water before applying a coin-sized amount of shampoo touch by touch onto 5 key zones of the hair. Add water and emulsify. 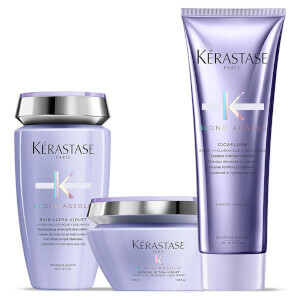 Focus this first wash on the scalp using finger tips to massage the scalp and remove impurities. Rinse thoroughly. Apply a second quarter-sized amount of shampoo touch by touch and add water. The second lather will produce a more abundant foam which will help cleanse lengths all the way to the ends. Rinse thoroughly. Shampoo: Aqua / Water, Sodium Laureth Sulfate, Glycerin, Coco-Betaine, Sodium Chloride, Cocamide Mipa, Citric Acid, Sodium Benzoate, Sodium Hydroxide, Hexylene Glycol, Hydroxypropyl Guar Hydroxypropyltrimonium Chloride, Salicylic Acid, Limonene, Tocopherol, Leontopodium Alpinum Flower/Leaf Extract, Sodium Hyaluronate, Malva Sylvestris Flower Extract / Mallow Flower Extract, Potassium Sorbate, Parfum / Fragrance. C224268/1.